there are 6 males and 5 females, the last born female and male (both correct) were stillborn. One female with 3 crowns. Juno & Marigold we have chosen a male that is not a champion but has the ability. For example Rebel, who is an InterCh. & MultiCh. And also this time it´s the first litter of this male, but this time he lives in Denmark not in Czech Republic. 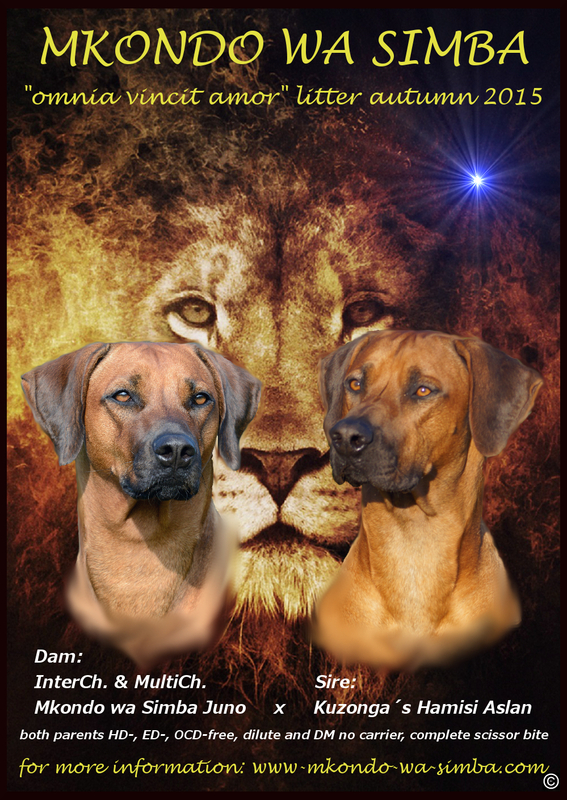 So again we don´t know what to expect but we are hoping for a healthy and beautiful litter out of "Kuzonga´s Hamisi Aslan". it´s "InterCh. & MultiCh. Tarujen Mabaru". His mother is "Ch. Kuzonga´s Cirkeline". "love beats everything". All about Juno you will find here at "Our dogs". Our breeding program sets a high value on good health and a social character also with other dogs. The parents have to complement one another in their bodies. Furthermore we try to breed with rare pedigrees, not intended for simply reproduction.